Umcka Cold+Flu Orange Syrup / 4 oz. - Nature's Way®. 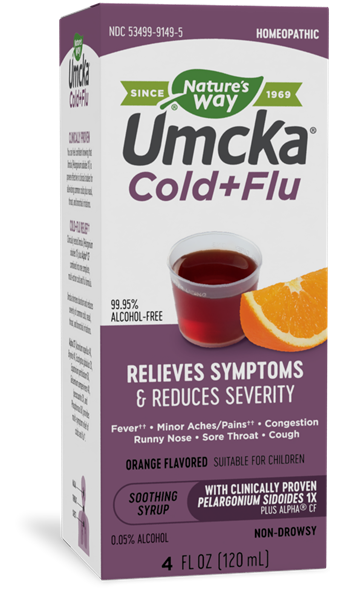 Products /Umcka Cold+Flu Orange Syrup / 4 oz. CLINICALLY PROVEN You can feel confident knowing that Umcka (Pelargonium sidoides 1X) is proven effective in clinical studies for alleviating common colds plus nasal, throat, and bronchial irritations. COLD+FLU RELIEF†† Clinically tested Umcka (Pelargonium sidoides 1X) plus Alpha® CF combined into one complete, multi-action cold and flu formula. Alpha CF (Aconitum napellus 4X, Bryonia 4X, Eucalyptus globulus 2X, Eupatorium perfoliatum 6X, Gelsemium sempervirens 4X, Ipecacuanha 3X, and Phosphorous 6X) provides multi-symptom relief of colds and flu††. For best results, use at first sign of symptoms and continue to use for an additional 48 hours after symptoms cease. Use only with enclosed dosage cup. Children 6-11 years of age: Take 1 teaspoon (5 mL) three times daily. Stop use and ask a doctor if new symptoms occur, symptoms worsen or do not get better within 7 days. Fever worsens or lasts more than 3 days. Cough lasts more than 7 days or occurs with rash or persistent headache. These could be signs of a serious condition. Homeopathic - Shortens the duration and reduces the severity of throat, nasal and bronchial irritations.